The SharedSiteLinkService, which is new in the v2 Oath: Ad API, provides methods for creating, updating, and retrieving shared sitelinks. These are created on the advertiser account level using the shared sitelink endpoint. Once created, you can share and link these to any campaign or ad group. The linking to campaigns or ad groups is handled by the Shared Sitelink Setting endpoint, described in the section below. The status field is reserved for mutable entity state and user transitions. Note that the REJECTED value here is set by the system editorial review. See the diagram below for an illustration of how this works. 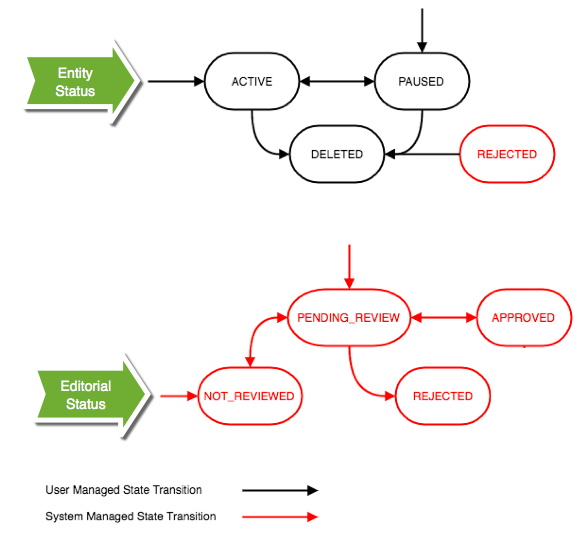 The editorialStatus field is reserved for read-only system editorial review transitions. Note that this field is read-only for Adds (creates) and Updates. For the v3 Oath: Ad API, Upgraded URL attributes are now supported for the Shared Sitelink object type. The following table describes the supported UU attributes per the Shared Sitelink object type in v3 Oath: Ad API. dp means deprecated in the above table. The landing page url is deprecated only for search. The Final url will be eligible in a native context. Native-only ads are not required to use the final URL and may continue to use the landing page url. For more information on Upgraded URLs (UUs) in v3, refer to Upgraded URLs. ACTIVE The sitelink is running. PAUSED The sitelink is paused and can be re-activated. REJECTED The sitelink was declined due to policy violations. Further information is available in the Ad Manager UI. DELETED Set the status of the sitelink to DELETED in order to delete the ad; once this is done, the ad is removed from the system and cannot be reactivated. Only one advertiserId parameter is allowed to be passed in as a query parameter for all filtered lists of shared sitelink calls. Method: To create a new shared set, make a POST call. The response will be the newly created shared sitelink. Method: To update existing shared sitelink, make a PUT call. The result will be the list of updated shared sitelink. Method: To delete a shared sitelink, make a PUT call. In v2, the DELETE operation is supported for both single and multiple ids.